Get ready for your next big Martian adventure! It's not a Hollywood epic about the stranding and rescue of a lone astronaut, but a real-world expedition: the Mars 2020 rover mission. And NASA's newest robot explorer isn't going alone. Mars 2020 is being accompanied by the first-of-its-kind Mars Helicopter. Yes, in this case, NASA saved its innovation for the engineering, not the nomenclature. In late January, the fully assembled softball-sized, 4-pound robot with twin rotors was tested at the Jet Propulsion Laboratory in Pasadena, California. Even Mars' lower-surface gravity, one-third of Earth's, was simulated during test flights, with a special tether providing a constant upward tug. 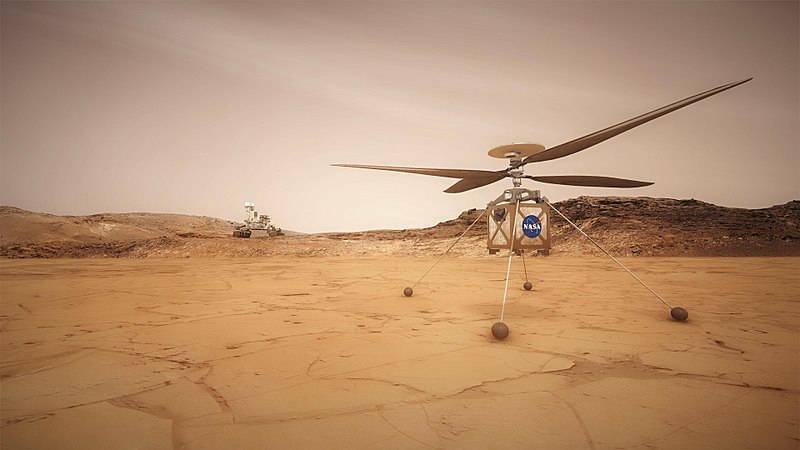 Mars Helicoper passed its two hovering test flights with flying colors, so to speak. The next time the helicopter takes off will be on Mars, in early 2021. 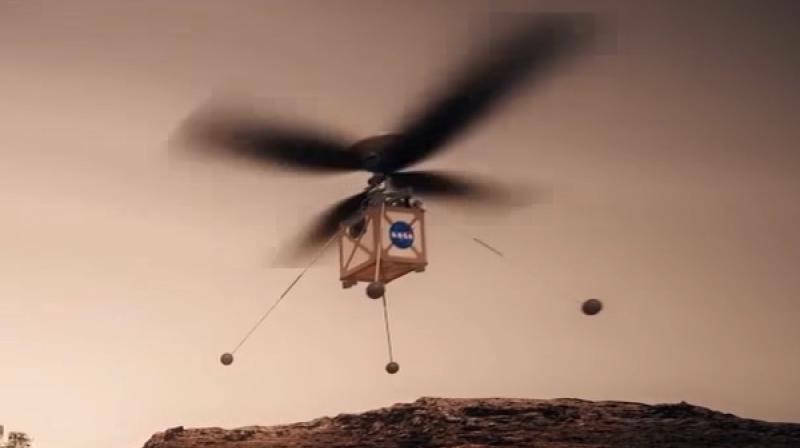 Mars Helicopter is accompanying its mother-ship rover as a demonstration of technology that can be put to use on future missions -- a beta test to see how well the technology performs on Mars, and to learn what features and capabilities might be included in next-generation copters. Rovers are great for getting around on the surface of another planet, but the six-wheeled robots can't roam everywhere; some terrain is navigationally challenging or simply impassable. But a rover with a tiny solar-powered, flying camera-bot can deploy it to get close looks at intriguing geological features, scout what's on the other side of hills and ridges that the rover can't get to, and maybe even collect rock and soil samples over a wide range of territory. Mars scientists are probably waking up late at night imagining how to put future whirly-bots to use. The exploration of Mars has been an exciting ongoing adventure for the past several decades, but Mars 2020 has the potential to deliver the most exciting news yet: evidence of past Martian life. Not since the Viking landers conducted inconclusive experiments to detect signs of present life has a mission looked for Martians. Physically modeled after the rover Curiosity, which is presently looking for, and finding, clues to Mars' past watery climate, one of Mars 2020's objectives is to look for signs of anything that might have lived in those ancient seas and lakes. Along with a suite of highly advanced scientific instruments, the rover is also carrying an experiment, MOXIE, to produce oxygen from Mars' atmospheric carbon dioxide to test how future human explorers might produce breathable oxygen from the Martian environment. With each successive landing mission, NASA adds something new to the conversation about the exploration of Mars. In 1976, the Viking missions achieved the first successful landings on Mars, allowing for our first surface-view of the planet. They also attempted, optimistically, to find life. In 1997, Pathfinder carried the first rover, Sojourner, to set wheels on Martian dirt, and the 330 feet it traveled from rock to rock at the time felt like a marathon. In 2004, Spirit and Opportunity were the first wheels-on-the-ground expedition to search for signs of past water on Mars, culminating in a spectacular 15-year, 26-mile odyssey of discovery by Opportunity. The 2012 landing of Curiosity kicked off the first mission to take us on a tour through time, reading the pages of Mars' climate history through sedimentary layers going back a couple billion years. And the most recent mission, InSight, will give us our first look inside Mars, straight to the core. 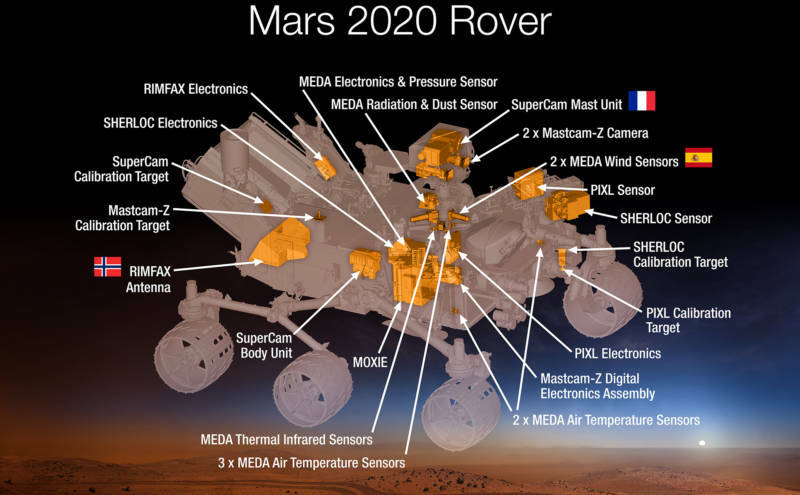 The Mars 2020 mission, rover and helicopter, will launch in July 2020, with a landing projected for February 2021. From all that we now know about Mars' once more Earth-like conditions, about the tenacity and adaptability of extremophile life forms on Earth, and about the efficacy of the formation of organic compounds under the right conditions, scientists are optimistic that Mars 2020 could find evidence of life.